After leaving Cedar Rapids for a Clear Lake fishing / camping / biking trip, I decided to take roads less traveled by – two lane roads. There is a lot you miss by driving on the expressways. When passing through the town of Ackley, Iowa (about 30 miles east of I-35), a western-style building called Triple T Specialty Meats looked kind of inviting. That was tempting to a hungry carnivore! They have quite a selection of tasty products including some yummy beef jerky, various flavors of bratwursts, and the absolute BEST peanut butter cookies I can ever remember. By the this time the blood sugar had dropped quite a bit… Lunch was beef jerky and two peanut butter cookies. 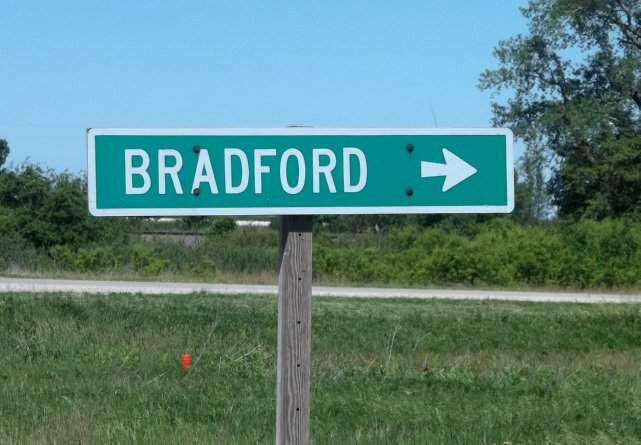 Along the way, I stopped by the small town of Bradford, Iowa. It’s a good idea they have this green warning sign alerting visitors to the dangers ahead. It would have been cool to stand next to the sign but that particular spot was on a steep incline making it hard to stand. From the other direction, the sign was right by a railroad crew that was fixing signals. It was easier just to move on. The town of Bradford is just a spot on the map – nothing too fancy. In the twenty or so years since last passing through, the area has changed quite a bit now. 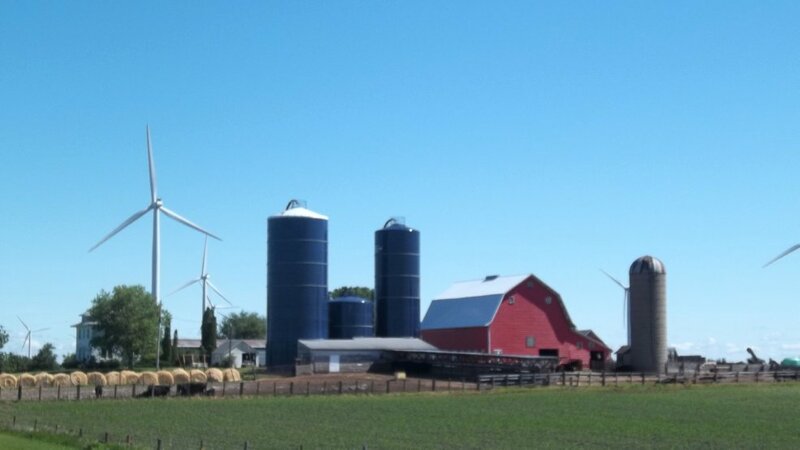 They’ve added a windmill farm. Many people, especially those of us living in Iowa, don’t realize that we are one of the leading states for producing wind power. Close to 20% of the electricity generated in Iowa comes from this free resource. I’m thinking about enlarging this picture. It’s a reminder that Iowas can remain true to our agrarian heritage and still embrace new technology. 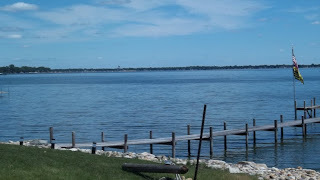 Looking out over Clear Lake from the North Shore Road. From the windmill farm it was time to find a place to camp. After exploring the state campground at the east end of town, I chose the more private McIntosh Wood State Park. Camping fees are reasonable – $16 will get you electricity. Unfortunately, you cannot throw away trash at most state campgrounds. The poor business owners (like where I filled up with gas) likely get stuck with it. 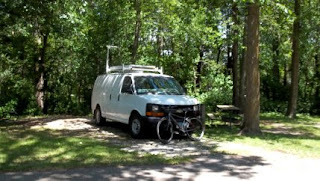 From the campground it was a fifteen mile trek (pun intended) on the Trek bike to the town of Mason City. The first half of the ride was through shared city streets. I was amazed at how bike friendly the folks of Mason City are in that regard. On the way out of town, I wanted to snap a quick picture of something of interest to many of us. 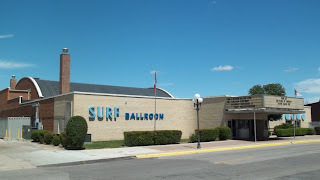 The Surf Ballroom is a famous landmark. Iconic performers have played at this venue and continue to even to this day. 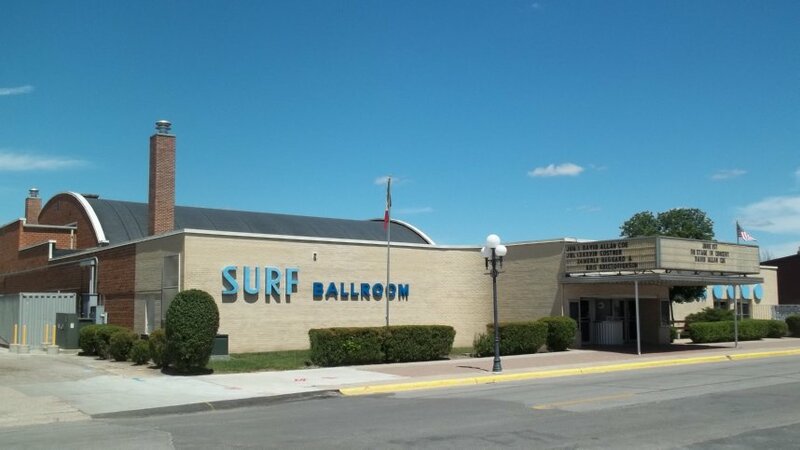 Sadly, it is also the last place where musicians Buddy Holly, Ritchie Valens, and J.P “Big Bopper” Richardson ever performed. On February 3, 1959, a small chartered Beechcraft Bonanza plane took off carrying the musicians who had just finished playing to an enthusiastic crowd. They crashed just a few miles north of town and all were killed. As the holder of a private pilot’s license, I know how dangerous it is to fly in heavy snow. It is likely the pilot have become blinded and disoriented by the white on the ground and in the air and may have flown into the ground. I plan to drive out to the site of the crash and visit the memorial today (Thursday) and get some pictures. The weather is too rainy to ride the bike this morning. After photographing the ballroom, I continued on to Mason City. The paved trail was relatively flat and paralleled the highway. It was a fun ride and a great chance to become more familiar with the new bike and its characteristics. Unfortunately, the sky was darkening to the west – a sign of things to come. If I was to complete this bike ride without problems, it had to be done with some degree of alacrity. Once in Mason City, I located a good friend. 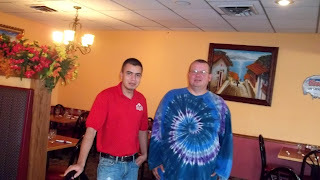 My buddy used to work as a waiter in a Mexican restaurant near where I lived last year. His name is Rigoberto. Recently Rigo called and said he had transferred to Plaza Mexico restaurant in Mason City. You can imagine his surprise when I biked there and greeted him. It was a pleasant visit with good conversation and great food. The meal of shrimp and rice (with veggies and sauce) was energizing. We parted ways and I agreed to visit again this weekend – I want to try the fajitas! The western sky had darkened by this time. A slow moving general rain pattern was encroaching on the area and would be followed with cold. 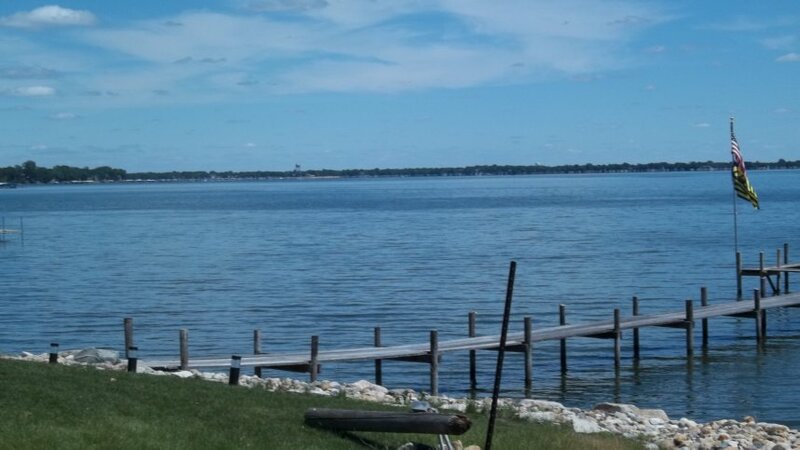 I headed back to Clear Lake with all the speed the tired legs could muster. For most of the return trip it sprinkled until the bottom fell out of the sky a half mile from the campground. The last few miles I itched what I thought was a bug bite but then realized it was something worse – a hive. The rest of the night was spent inside. Because the damp clothes didn’t “breathe” as I was riding, sweat built had up and allergic symptoms started to develop – similar to what put me in the hospital recently. It was strange – once the wet, clammy clothes were stripped off, I was actually a little overheated underneath. A combination of several things worked wonders – dyphenhydramine (Benadryl), cleaning thoroughly with baby wipes, and turning on a fan. Within a couple of hours the symptoms cleared up. The moral of the story is to carry Benadryl (or the $1 store equivalent). Don’t leave home without it. So now the plan is to go visit the Buddy Holly crash site, check out the Anytime Fitness location and maybe do some fishing today. With the cold, rainy weather it will be a good time to rest, curl up with a good book, and plan for another active day tomorrow.